Despite your best efforts to avoid them, the prudent mariner needs to prepare themselves, their crew and their boats to encounter adverse wind, wave and current conditions. Why? If you do much boating, you will eventually be exposed to the challenges of Mother Nature. This Tech Talk stresses avoidance and preparation – where to find weather and storm information and how to know what your boat can handle. We will also review important boat and crew preparation steps for when that stormy weather cannot be avoided. Specific boat handling maneuvers to deal with wind, wave and current effects will be discussed, including different strategies for sailboats and power boats. 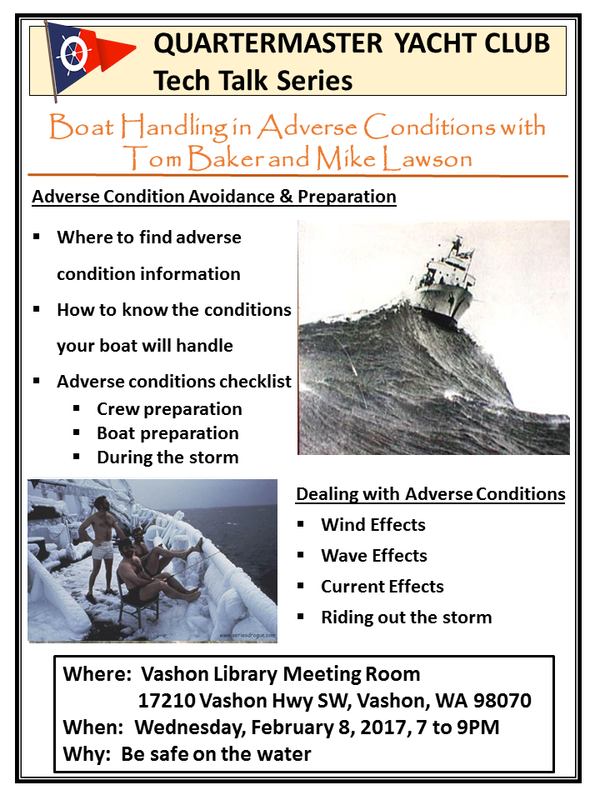 Bring your questions, your experience and most importantly your crew to this important Tech Talk hosted by blue water sailor Tom Baker and Captain Mike Lawson on Wednesday, February 8 at 7PM in the Vashon Library meeting room.